With its cast of skeletons and macabre “I see dead people” vibe, Coco may be the strangest thing ever to come out of the Pixar animation factory. That’s a good thing. Their latest animated movie finds the company spreading its wings and pushing into new territory, including betrayal and murder, without neglecting its family franchise responsibilities. It’s a tricky business, which Pixar, mostly, pulls off in high style. It’s a lot of plot, but the movie charms itself into our good graces when it enters the netherworld, a neon-colored nonstop fiesta that’s a blast even if you’re just a bag of bones. And, oh boy, those alebrijes, the fantasy creatures that leap around like Mexican folk art brought to vibrant life! It’s here that Coco picks up visual punch and a creative head of steam. On the Day of the Dead, those who’ve passed to the other side can also cross over to the living, as long as someone remembers them in the real world. If not, there’s nothing. Lee Unkrich, his co-director Adrian Molina and their team of screenwriters have conceived Coco as a salute to Mexican culture – the voice cast is almost entirely Latino, as are the settings. The film’s hero is 12-year-old Miguel Rivera (voiced by Anthony Gonzalez), a kid from the small village of Santa Cecilia who just wants to sing and play guitar. But his family of shoemakers forbids it. Why? It’s seems Miguel’s great-great-grandfather deserted his wife and daughter to hit the road and make it as a singer. His daughter, Mama Coco (Renee Victor), now sits silently in old age, lost in memories she never speaks of. Miguel, however, is driven to follow in the footsteps of Ernesto de la Cruz (Benjamin Bratt), the Mexican Elvis who died young – a church bell gonged him – but left behind hit songs and movies that the boy obsesses over. He even fantasizes that Ernesto could be his great-great-grandfather. If only the lad could meet him. While the kiddies wrestle with that conundrum, grownups will be treated to a story that involves real-world issues. Miguel finds a guide to the spirit world in Hector (Gael García Bernal), a scam artist who brings him to his idol Ernesto. What happens next is something viewers should discover on their own, but let’s just say more than a few family mysteries. Bernal and Bratt do their most resonant voice work in these scenes, and kudos to the latter for showing real vocal chops on the film’s biggest song, “Remember Me,” a lush ballad from the Frozen duo of Robert Lopez and Kristen Anderson-Lopez. There’s also “Un Poco Loco,” a snappy duet for Miguel and Hector that’s a real spirit lifter (literally). Which brings us to the dead. In one of those plot loopholes perfect for fables and kid-flicks, Miguel steals a guitar from the de la Cruz mausoleum, which leaves him cursed. The boy’s only recourse is to cross a bridge made of a magical marigold petals and slip into the underworld on Día de Muertos, beg forgiveness and maybe meet the late, great troubadour himself before being permitted to return to the land of the living. Did we mention that Miguel’s hairless pup, Dante (! ), follows him. Too cute? Maybe. But his furry friend offers much-needed comic relief. Coco brims over with visual pleasures, comic energy and emotional wallop. The climax is a real weeper as well: There’s something indelibly moving about a child getting in touch with the ancestors he’s lost and forging a bond that can last over time. Of course, a lesson is being preached to children about the need to respect elders. 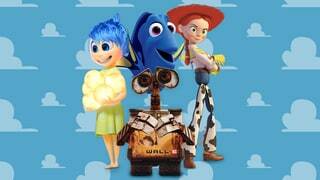 But Pixar’s 19th feature brings a soulful core to that message that helps the film ride over its rougher patches. It’s not in the master class of, say, Toy Story, Inside Out or Wall-E. But it’s definitely worth remembering.